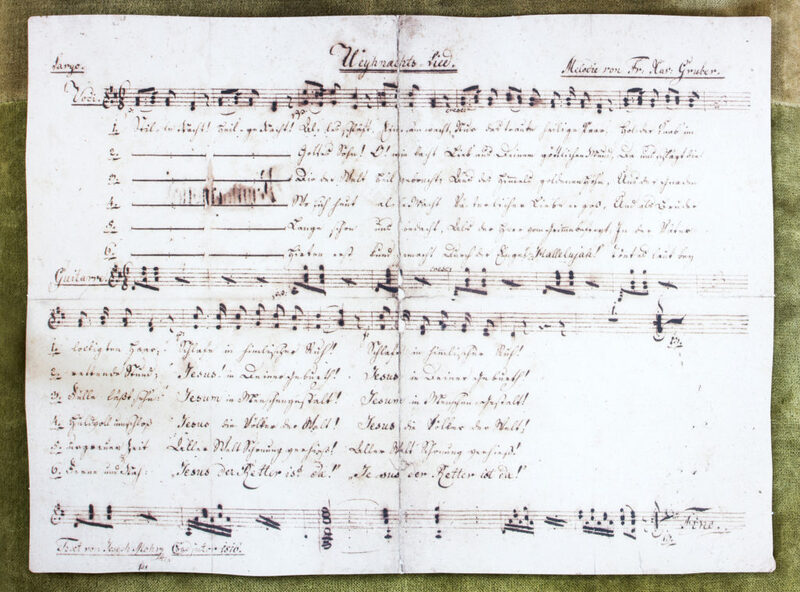 Families are welcome to witness the 200th anniversary of “Silent Night” as Salzburg and neighboring Austrian communities celebrate the song heard round the world. Since its first performanceon December 24, 1818,“Stille Nacht, Heilige Nacht” has been translated into 300 languages and dialects and still resonates with music lovers of all faiths. How Do You Celebrate a Song? Austria is celebrating Silent Night 200 from September 29, 2018 to February 3, 2019 so there’s plenty of time to appreciate the poetry, music and the rural silent nights that inspired it. In the city of Salzburg, already making noise at the holiday season for its ornate and festive Christmas markets, the Salzburg Museum will feature “Silent Night 200” all about the song’s myth, history and message of peace. The city’s Felsenreitschule will present a musical version of the song’s creation story November 24 and hopes for a long run. Salzburgland towns associated with the song’s composer and lyricist are celebrating the anniversary with special events and Advent Festivals. You can also catch a historical re-enactment of the Silent Night story to be done on the stage of Hochberg’s parish church. Two towns are already set for the influx of Silent Night 200 tourists because of their long history: Oberndorf, the hometown of the priest who wrote the lyrics; and Arnsdorf, home of the musical composer. Researchers today think that the song’s message of hope had such immediate impact because in the 1700s, political and economic hard times had befallen Salzburg, then a prince-bishopric in the Holy Roman Empire. At that time, Josef Mohr was the unconventional priest assigned to the Church of St. Nicholas in Oberndorf. Whatever the inspiration, he decided that an old poem of his about the night of Jesus’ birth might cheer his congregation. He asked Franz Xaver Gruber of nearby Arnsdorf, the church organist, to set it to music so it could be performed Christmas Eve. The church organ was not working, so Mohr performed his song on guitar — with Gruber and the church’s chorussinging along. Today, the picturesque Austrian village of Oberndorf boasts a sophisticated little museum at Silente Nacht Platz that will be open daily during the 200th anniversary celebrations. A small chapel commemorating the two was built between 1924-1937 on the ruins of St. Nicholas Church. Oberndorf’s Christkindlesmarkt features about 20 vendors selling crafts and lebkuchen, a traditional cinnamon biscuit. The local Tannenbaum evergreens are decorated with small lights and ornaments made of hay, lighting the festivities until silence descends. The museum building is thought to have housed clergy during the early 19th century. Inside, families can learn about mining salt and transporting it by barge on the rough Salzach River. Visitors can put on headsets to hear the song in dozens of languages but must head upstairs to sing along! Another room illustrates the story of two singing families from the Tyrol region who took the still anonymous “Silent Night” on the road with them, including a performance at New York’s Trinity Church by the then-famous Rainer Family Singers in 1838. From there, the song’s universal message of hope went viral and its fame grew so in Europe that in 1854, research done by the Cathedral at St. Peter’s in Salzburg revealed the identities of its creators, and the stories of Mohr and Gruber were shared with the world. And yes, the museum’s last room has a karaoke booth where guests can select to voice renditions by everyone from Elvis to Bing Crosby, and the audio file will be emailed to you. Tiny Arnsdorf has a different appeal because its two-level schoolhouse (two grades at a time still share a classroom) was where composer Gruber himself was teacher. Museum artifacts and some furnishings belong to his grandson, also a musician, who legitimized their claim to the song. Children will enjoy seeing the way a classroom of that era was set up. Next door, the Maria im Mosel Church is more than 500 years old and under restoration. Inquire about hours the school is open to the public. Thousands are expected to make the traditional 1.2-mile walk between the villages. The procession begins after the Christmas Eve mass in Arnsdorf. 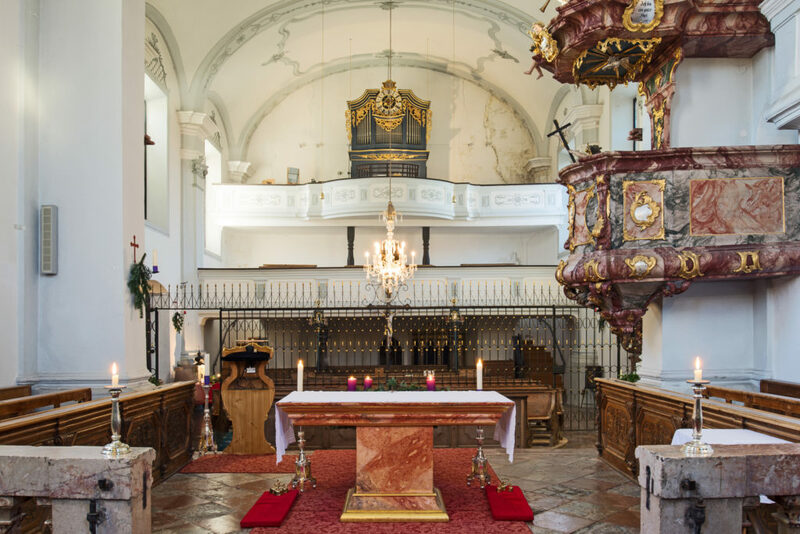 Visitors are invited to the simultaneous outdoor mass and, while carrying candles, can join the walk to the plaza in Oberndorf to sing the song outside the chapel. Don’t miss some of the Christmas Markets, open annually the fourth Sunday prior to Christmas Eve — there are charming small-town versions throughout Salzburgland. 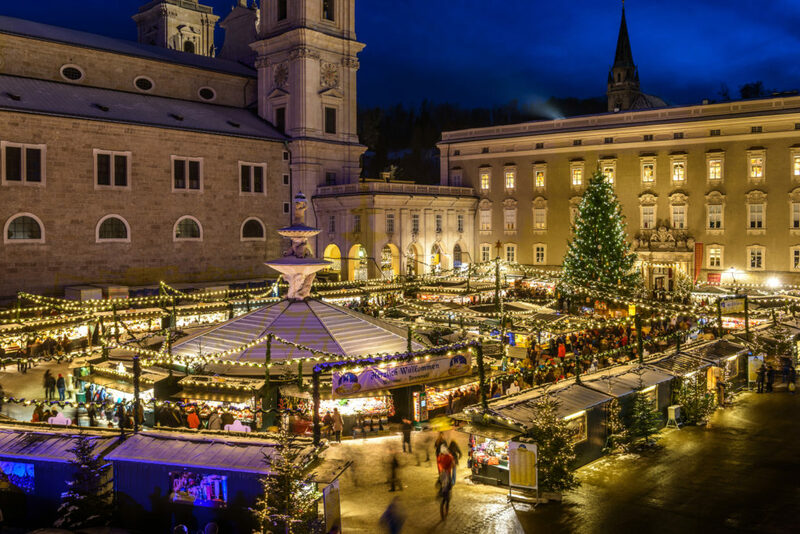 If you are based in beautiful Salzburg, about a half-hour away by taxi, seek out the the famous Christkindlesmarkt below the towering Hohensalzburg Fortress in the Old Town since the 15th century. Salzburg’s market is unusual because many more typical handcrafts and artisan works are sold than food, though gluhwein, bratwurst and strudel are bestsellers that bring in the locals after a day’s work. For more ideas of where to hear music and enjoy Salzburg with kids and for a holiday events calendar, please visit Salzburg Tourism. Taxis and limited public transport serve the region year-round. In summer, the bicycle path that runs from Salzburg along the Salzach River (ask at your hotel about renting bikes) is flat, car-free and very scenic. 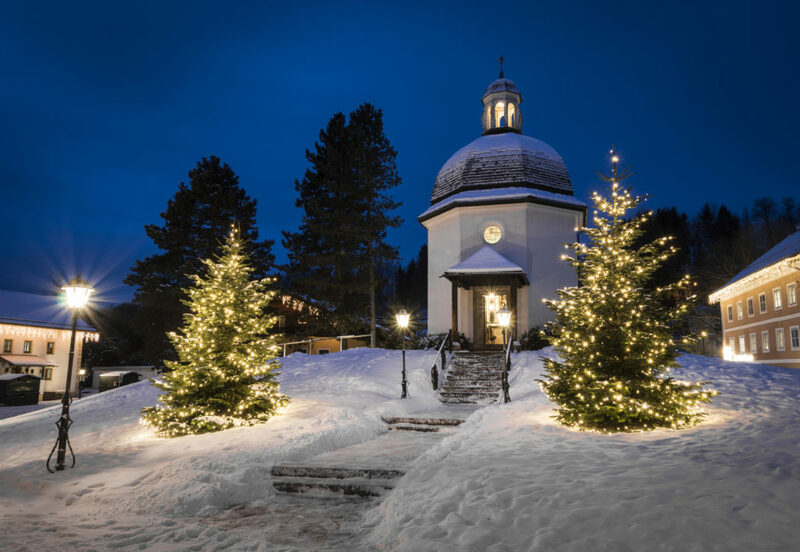 In just 90 minutes, a fit bicyclist can be in Oberndorf to see the “Silent Night” museum and chapel and return to Salzburg’s big city life the same day. But.. you can also slow down a lot and spend a quiet night at the closest gasthof, Hotel alt Oberndorf Bauern Brau, around the corner from the Oberndorf museum. They have 24 simple rooms (one to three beds in each) and a terrific homey restaurant.